We're Now On Apple News! We're excited to announce that you can now find Basis 365 on Apple News! 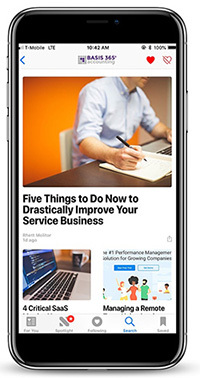 Apple News is a personalized experience that allows you to keep up-to-date with all the latest news without having to jump from app to app. To find us, open the News app on your iOS device and search "Basis 365" or use this link to do that for you https://apple.news/TvfxqZnf4SHC0kX0sFZlyiQ. Tap the heart icon at the top of the screen to follow us and stay up-to-date on accounting and bookkeeping news affecting your small business.